I wish to thank Becky Wash the Curator for Essex Police Museum and her assistant Bryan Turner for providing me with a list of all serving Police Officers in Great and Little Wakering since the formation of Essex County Constabulary in 1840 up until the end of World War II. 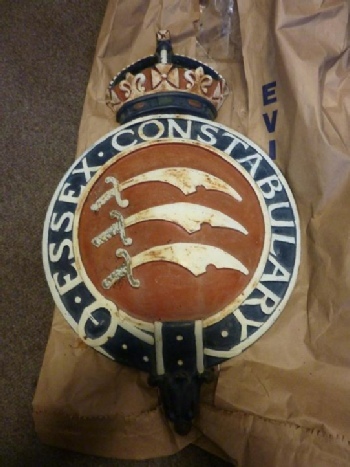 Essex Constabulary and Southend-on-Sea Borough Constabulary amalgamated in 1969 to become Essex and Southend-on-Sea Joint Constabulary, which was renamed as Essex Police in 1974. In 1977 Laurie Street was appointed Section Sergeant at Shoeburyness Police Station with overall responsibility for the Wakering beat. He held this position until he retired in 1988. I will be adding to this information in order to bring it up to date. In my research, I have had the privilege of meeting up with and talking to ex-serving members of the force namely, Inspector Dudley Balls, Police Sergeant Laurence Street, Police Sergeant Fred Feathers, PC Colin Stockwell, PC Ken Corbett, PC Malcolm Young and PC Paul Wilgress. I have also spoken to Tony Blake who served as a detached beat officer at Stambridge Police Station for 28 years until 1991. I have spoken to Jack Chapman the grandson of PC John Chapman who was the first officer to be based at Little Wakering Police Office in 1903 and he will hopefully update my information on him soon. I have recently had the pleasure and privilege of meeting Kay Marshall, widow of the late PC John Marshall who was one of the first officers to live in the new police houses in High Street, Great Wakering. Read her memoirs here. Prior to 1951 the Police House was situated on the left (walking towards the church) just past the existing Co-operative Supermarket (probably where ‘Rag Mama Rag’ shop, 14 High Street, is today). In 1951 two new semi-detached houses were built in High Street, Great Wakering and PC Ken Griffiths was the first officer to move in to number 288, followed by PC John Marshall in to number 290. Circa 1969, four pairs of Semi-detached houses were built in Southend Road to accommodate incoming County Officers to take over the running of the Southend-on-Sea Borough Force. A superintendent, Chief inspector and others lived there in Police accommodation. They are still known as Police houses but are no longer Police owned. During the 2nd World War, a War Reserve Constable named LAYZELL lived at 304 high Street (not a Police house). War Reserves were similar to special constables but got paid. They did not wear a Helmet but a 'Peeked Cap' but apart from that they had the same powers as a Police Constable. There was a rumour that Layzell had previously been a Metropolitan Police Inspector and took up the post of War Reserve when he retired. He was reputed to be something of a tyrant and very officious. Police Community Support Officer for Wakering, supporting PC Steve Thomas. Neighbourhood Constable for Wakering, based at Rochford Police Station. Had a large pointed moustache. Resigned on 25th January 1989 after 29 years service to pursue ‘another life’ in property renovation and maintenance. He came to Great Wakering from Rochford where he was the Area Car driver covering Hockley, Hawkwell, Hullbridge, Stambridge, Canewdon, Paglesham, Wallasea Island, Great Wakering, Little Wakering, Barling and Foulness Island. MOD Police were employed on Foulness Island for security, but the parish was policed by Essex Constabulary. Colin had a stroke on 13th January 1999 which affected his speech. His beloved wife Sandra died of Cancer. Served 25 years at Great Wakering. Moved into one of the newly built Police Houses in the High Street in 1957. John was living in Leigh-on-Sea when he died on the 4th December 2010 aged 79 years. He left his widowed wife Jean. He was cremated on Monday 20th December 2010 at 3.00pm, at Southend Crematorium. John served from 1956 to 1982 at Braintree, Brentwood, & Great Wakering. Served at Great Wakering from 1951 to 1955. He and his wife Kay moved into one of two brand new Police Houses at 290 High Street, Great Wakering. PC Ken Griffiths was already living in the other house. John died suddenly of a brain haemorrhage in 1984 and his widowed wife Kay has fond memories of her life as a policeman's wife in Great Wakering. I was privileged to meet her at her home on 27th January 2012 where she shared some of those memories with me. Peter Griffiths, Ken’ son, has given a very brief history of his father’s life which can be seen here. Awarded Merit badge in 1915 for Meritorious conduct. Died 1937. There was a painted finger board which carried the inscription ‘COUNTY POLICE’ and pointed towards the centre of the road opposite what was the Post Office which was situated in the front room of Mrs Dawkin's house who was the Post mistress.